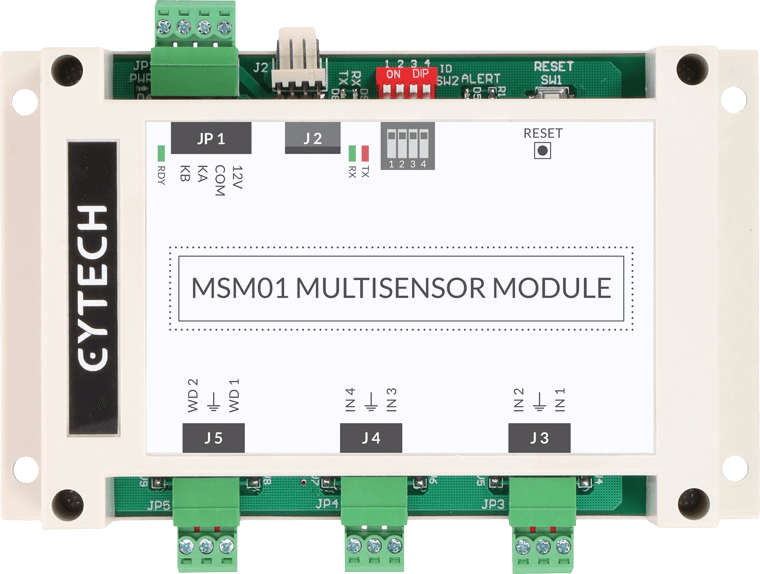 The MultiSensor module MSM01 has built in temperature and humidity sensors, with 2 external inputs for water leakage detection cables as well as 4 general purpose inputs for use with the Cytech Environmental Monitoring System CM9001-EMS. CM9001-EMS is an advanced Environmental Monitoring System which monitors equipment failure as well as sensor data so that alarms can be triggered if programmed setpoints are exceeded in unattended facilities like data centres, server rooms, wine chillers, telecom base stations, and pharmaceutical freezers. CM9001-EMS is a modular system which allows easy expansion of functions, Input/Outputs, and external interfaces like Modbus, KNX and C-Bus, or RS232 and RS485 interfaces. MSM01 can also be used to supply temperature and humidity data to Modbus, KNX and C-Bus and other systems.